Both slow play and stalling are infractions against tournament rules for the Sprue Posse events. Both infractions are difficult to clearly spot and police as they are somewhat subjective in nature. Below are the definitions of each, examples of each and the action the judging staff will take against the infractions. As with all violations of tourney rules, if you are witnessing them, it is your responsibility to notify a judge. We can't help you if we don't know that it is happening. And we can not reverse a game result based on post-game reports from players. If slow play or stalling is affecting your ability to win a game, you must call a judge. A player is guilty of Slow Play if he fails to perform game actions in a reasonable period of time. Note that total time taken to complete a turn is not a factor of slow play, but rather time spent doing nothing at all. As soon as a player takes a 20-30-second reflection without any action, this is worth issuing a caution, so that he knows he's taking too much time. For example, an ork player that takes more time to move his larger model count army during the movement phase has not committed a slow play infraction. But a player who stands inactive during his own turn for a measurable amount of time has. The typical time a player will seek additional reflection is when they believe they are faced with a complex situation but what both player and judge need to realize is that this situation is usually the result of a less complex situation last turn. Unless the game state has radically changed. What this means is that players are afforded plenty of time to contemplate their next actions while the game state changes during their opponents turn. This time should be considered available to make most of the decisions in their following player turn. On occasion, the game state might radically change with little or no time before the player turn changes hands, an example of this might be a crucial unit failing a pinning test or morale test at the end of a phase, or an unexpected result to a major close combat. The judges will take situations such as these under advisement when determining if slow play is occurring. After a judge has been called over to watch for slow play, or if a judge has decided to watch for it independently, and the judge then witnesses an infraction, he or she will notify and caution the player. Players should not expect this caution to be an official presentation. If a judge says to you "Please play faster" or "You have to make a decision now" consider yourself cautioned. After being cautioned, the judge will continue to observe, and should the infractions continue, the player will receive an official warning. This warning will have much more of an official presentation. "I am issuing a warning for slow play. Further infractions will result in a game loss." would be a typical official warning. The judge will remain at the table from this point, and any further infractions will result in a game loss. The primary difference between slow play and stalling is that stalling is willfully and knowingly abusing the existence of a time limit. Stalling is identified in all the same ways that slow playing is with one additional method. Stalling may be noticed if a players natural rhythm changes based on the game state changing. 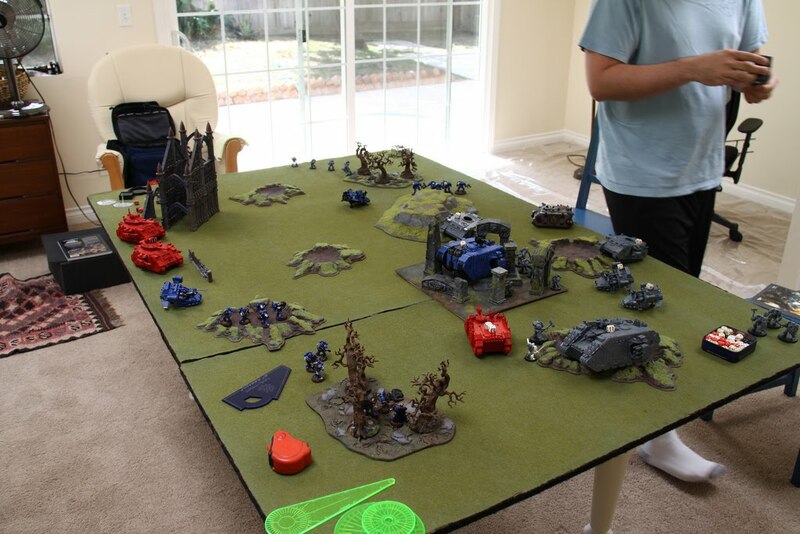 For example, if a player has built up a reasonable kill point advantage against his or her opponent in the early turns of a game while playing at a brisk pace, and then from that point on starts weighing every decision, and taking extra time between moving models and choosing shooting targets, that would be an indicator of stalling. Someone suspected of stalling will receive a caution, then an official warning, and then a game loss in the same way as someone committing a slow play infraction. While slow play and stalling both have the same negative impact on a game, slow play is usually committed by new players, nervous players or casual players. They may not even know they are committing this infraction and they may not even know what a judge is saying when he or she issues a caution and then later a verbal warning. Judges are aware that time passes more quickly for players than for observers of a game, but players need to be aware that this is no excuse for a game to be played slowly. Judges will use their own discretion in determining how swiftly a caution will escalate to a warning and then to a game loss, taking the time to explain the slow play infraction should the player need an explanation. Players suspected of deliberately stalling will conversely be cautioned, warned and ultimately issued a game loss much more swiftly if the judge believes that the player understands the rules but insists on abusing game time limits. 0 Response to "Rules: Slow Playing and Stalling"